Many Indian women love to wear a string of fragrant flowers in their hair. The most common and refreshing ‘gajra’ is made with white mogra buds or jasmines. This tatted version is a split ring braid where each ring is folded inwards at the base to represent sepals. The braid tats up straight, but can turn corners with minor adjustments (this will be shared in a later post). Size 50 Anchor white. For the calyx, I used 2 strands of Anchor embroidery thread. Besides the right shade, the 2 strands also give a fuller look. 1. When working the next ring, do not start the shuttle 2 stitch very close to base. Leave some bare thread space allowing the segment to fold inward. 2. Post shuttle 2 from front to back, through the ring, before closing it. It defines the fold and brings shuttle in position. 3. Keep the green thread at the back/wrong side of the braid throughout. Repeat SR2 for desired length, following all instructions. 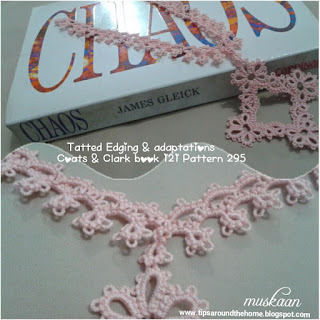 fs/bs tatting: I tatted the even-numbered rings using reverse order of stitches (RODS or backside tatting) only for the white segment. The green segment was tatted same throughout. And I posted both shuttles through the ring before closing it. Blocking : While the braid lies flat, I did block it in order to pull the rings into a longish shape. Starting the first split ring . ... post shuttle 2 through the ring before closing it. If required, turn the green picots inwards with fingers before closing ring. TW. Start 2nd split ring. Before starting the green segment, leave bare thread space. Post shuttle. Close, lock or shuttle join to previous ring and turn work again. 3rd split ring made and lock join being made. Ensure that the green thread stays at back of work. Odd numbered rings (along left of braid) are worked from front. Above pic shows a close-up of the braid from front. Even numbered rings (along right of braid) are worked from the back. 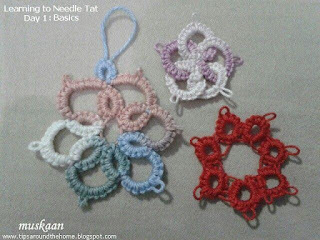 As mentioned above, these rings can be worked with backside tatting. Always remember to post shuttle. This backside close-up shows the zig-zag of green bare thread between rings. UPDATE (Apr 10): There was some confusion about the direction in which 3rd ring was formed, and a suggestion to add a diagram or arrows showing direction. In response, I have diagrammed the pattern, along with main instructions. This one-page pdf is a complete pattern. Yet again, this is a basic braid pattern and playing with beads, colours, and sizes, can broaden the scope & effect. One idea is to add a very short Josephine/spiral chain between rings and twist the ‘buds’ around. 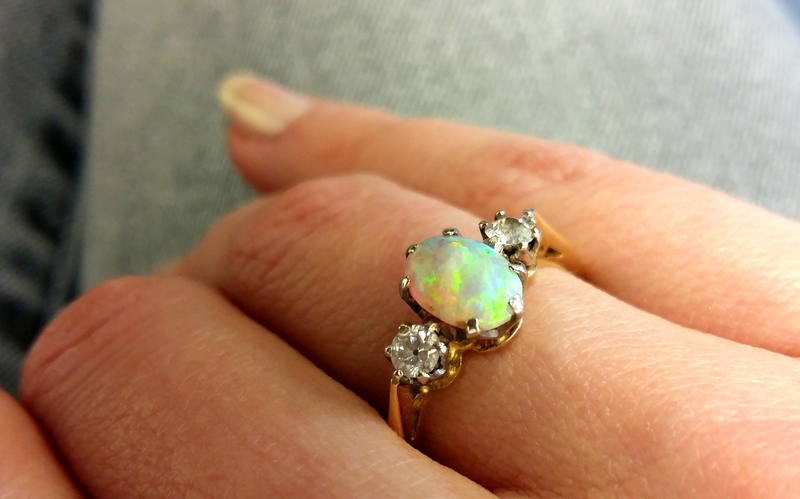 Another idea is to use 3D Josephine rings for buds as used here, and maybe a curled ring for calyx. I would love to give this a go sometime! marigolds in a row ! This is the first of 3 patterns celebrating spring. A garland (‘toran’) of marigold interspersed with mango leaves is often seen on entrances and is considered auspicious. My visualization here is a symbolic of the explosion of marigolds with advent of spring in India and can be used as a necklace. Incidentally, marigolds are centuries-old migrants from Brazil ! This garland tats up straight but has enough play to be worn as a necklace. Single flower(s) can be used as applique, brooch or other embellishments. A cluster of flowers can be tatted, too. Add beads and the applications/uses multiply. Materials : 2 shuttles - orange in shuttle 1 for flower and green in shuttle 2 for foliage. Techniques : Layered Onion rings (OR), long picots, thrown rings, onion ring join (ORJ), long picot join or decorative picot join. Measurements : A little over ½ inch wide and length as required. Since there is an element of freestyle in this pattern, the instructions can be considered as guidelines. 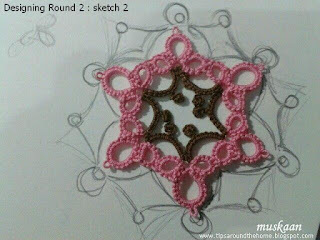 Repeat for required length, joining R2 to previous flower at 3rd picot. Keep the joining loop long to imitate a picot. 1. all picots (p) are long, including while joining. when making the onion ring join, pull loop of chain thread through inner ring picot, pass shuttle, tension and make 2nd half stitch only. 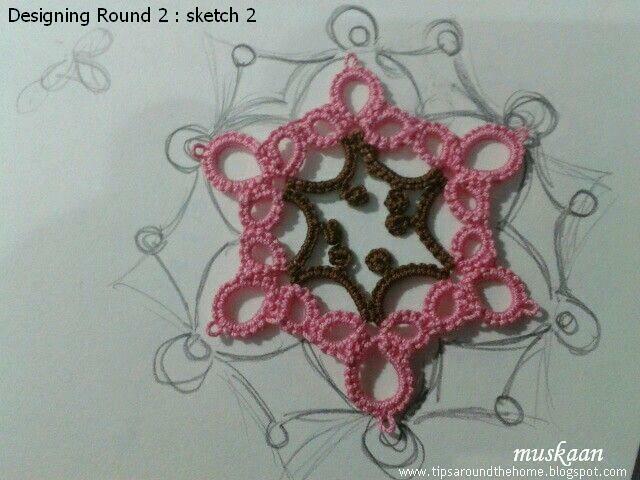 Continue with pattern to complete the other half of ring. One pair of unattached marigolds made. Start As before, fold the inner ring forward and start the outer ring from behind. ...leave some slack on the loop - equal in length to the long picots. You will notice an extra length of thread, but it adds volume for a denser look. Once the ring is closed, the extra thread is not visible. This method of joining at a distance keeps the flowers symmetric and equidistant. I termed it long picot join or decorative picot join. 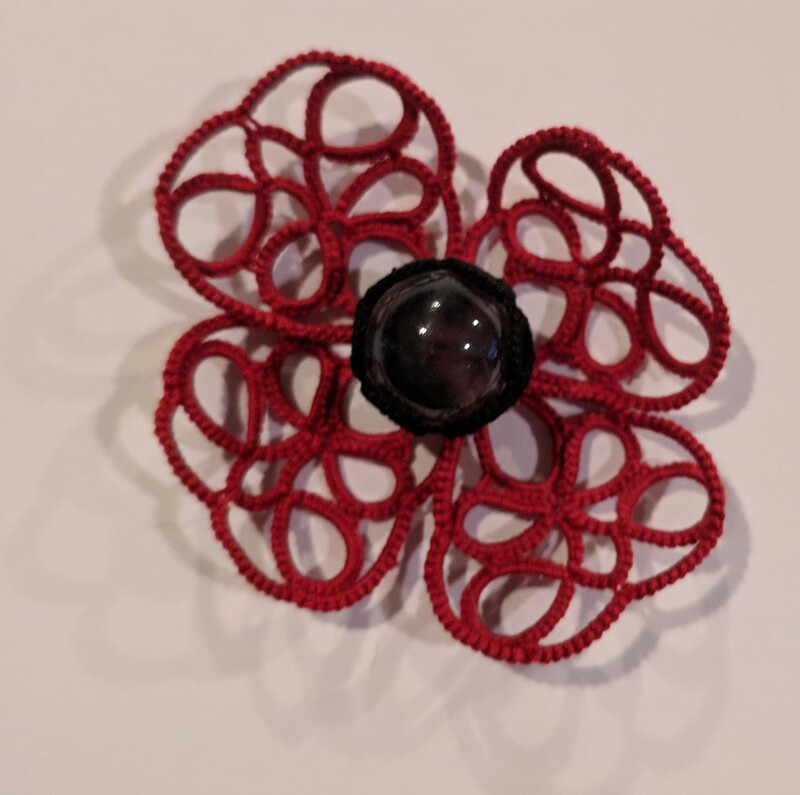 A bead in the center of the flower would look great, wouldn't it ? This is it for now. 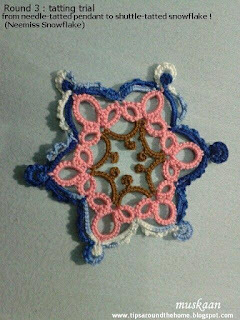 I hope you like the pattern and enjoy tatting it as much as I did ! 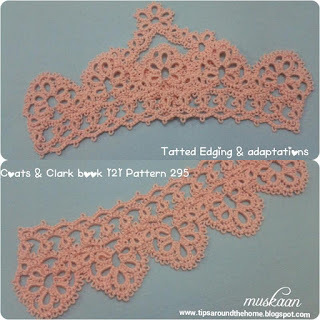 I will update the pdf link here, as well as on my Patterns page later. I’d like a bit of help, please. I checked and rechecked, counted and recounted, compared with original tatted model, … and was very confident that what I wrote and tatted was correct. Then I Googled and found many tatters have made and blogged about the same project over the years, but there was no mention of anything amiss. One ring and chain are diagrammed above, along with stitchcount. When there are many picots separated by the same number of stitches, we like to shorten the notation by putting a single repeat within brackets followed by the number of times the bracketed segment needs to be repeated. With experienced tatters, our brains autocorrect ; but for new/beginners incorrect notations can cause unnecessary frustration. It is this latter scenario that makes me more vigilant now. C or D for chain ? Just to complete and justify the title, here are a few other ways we come across for the diagram above. “sep” or “sep by” is shortened from “separated by”. It gives us only the number of stitches between the end picots in that segment …. These are a few that are most often used when converting descriptive antique patterns to shorter modern format. In keeping with the season, I chose spring colours. Tatted with 3 strands of embroidery thread/floss. It is such a pretty pattern ! Now that I Googled it, I find that it is also called 'Butterfly Heart'. I will share my own notes and the revised pattern in a future post. That butterfly has one wing smaller. Instead of retro-tatting, I made a Josephine ring head and wrapped the tail thread around to simulate a body. I have often wondered why I tat - why does it consume me and fascinate me ? Most articles made are for beauty & decoration, not functional or wearable, and get stashed on completion. It is time-consuming unlike crochet or knitting and so much more difficult to unravel after a mistake. Yet, give me a shuttle any day! 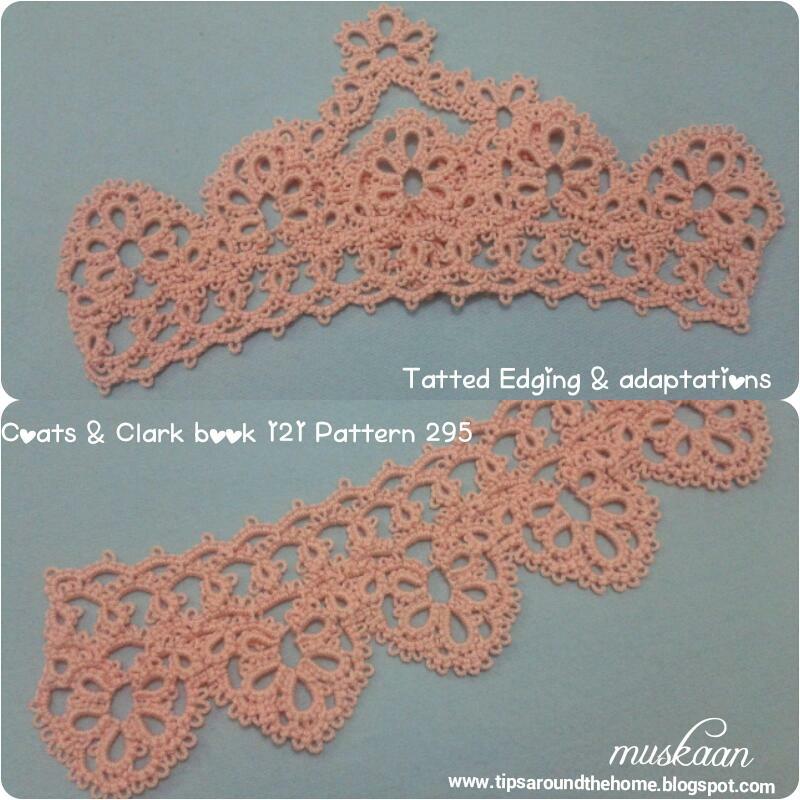 Perhaps it is that lace, besides being pretty, is small enough to experiment with and stash away too. That small piece is complete in itself, yet does not take up space. The tools & materials are minimal, too, hence easily portable when traveling. It does keep my hands 'productively' occupied, my brain challenged, and my curiosity sparked. 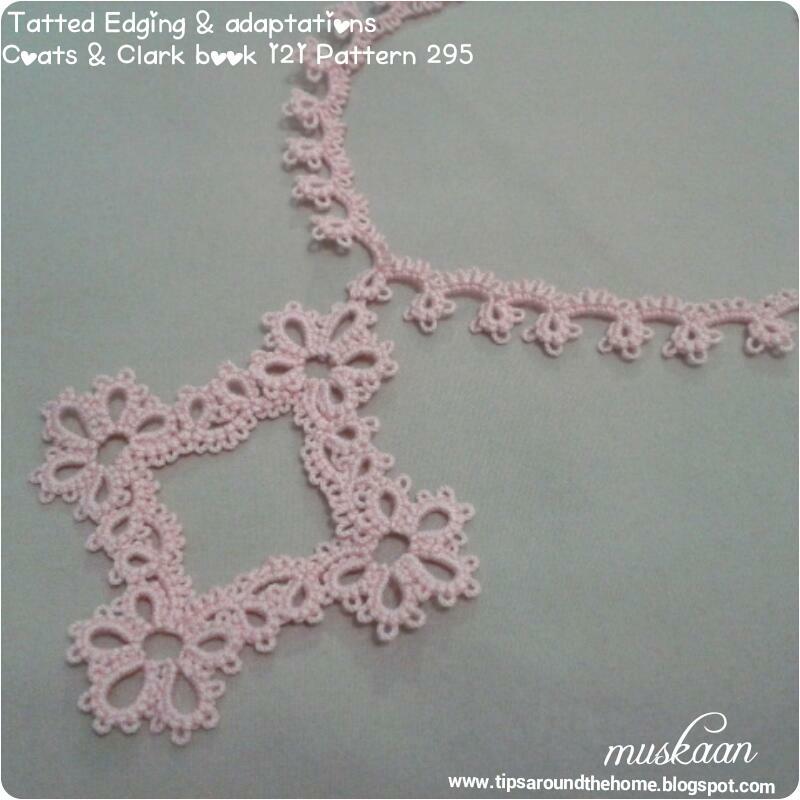 Or may be some brains are just wired to tat - our default is tatting, even if we enjoy other crafts ?! Why do you tat ?! Hexagons always appeal to me - be it in any art or craft form. Tatted snowflakes are aplenty, but the focus is on tips/points with 'invisible' or inferred sides. Addionally, I love when chains are used to outline previous elements, highlighting aspects with width. No wonder this pattern was such a pleasure to tat - a clear-sided, textured, yet elegant pattern. I follow Anna's blog and love her beautiful tatting and other projects. She shared this pattern here recently. I chose a lighter outline to represent the flower in nature. Clover is a cleverly designed pattern. Joining to the vsp at beginning of chain in each leaflet creates a charming center which is evident in the left leaf and much more in Marya's model. The left leaf follows her pattern verbatim, split chain and all. The right one, tatted first, is a bit of a lazy tatting attempt. Here, I worked all 4 leaflets completely, instead of a split chain, and then tatted the chain stem. for sharing their pretty patterns. 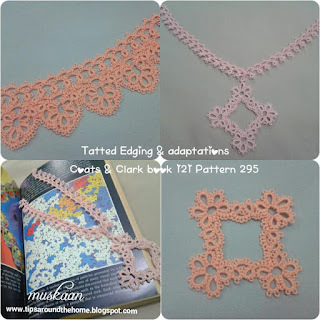 Remember this vintage pattern I was 'modernizing'? Anetta spotted why the straight edging curved into a collar - a missed ring ! Decided to tat the entire pattern again, so as eliminate all chaos in pattern-writing while climbing out of rows. It has a dense centre (row 1) with all those picots, but I really like the scalloped shape. And the versatility is visible in the various projects derived from that one edging pattern ! Add beads and you have such a plethora! Please note : Adding a short chain at end can enable us to work the entire 5-row pattern in one pass !! The sequence of working the rows will change, though. I have not changed any stitch count. Row 1 ruffles. I used my usual rolling pin blocking method after shaping with fingers. I had more pics, but they are inaccessible at present. Many many thanks to Georgia for "empowering" us ! UPDATE (April 5, 2017) : In class, there were queries on how to tat all 5 rows in one pass. I have now diagrammed a revised version to address this. 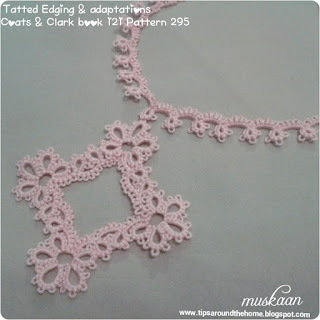 The sequence of tatting the rows, however, changes. 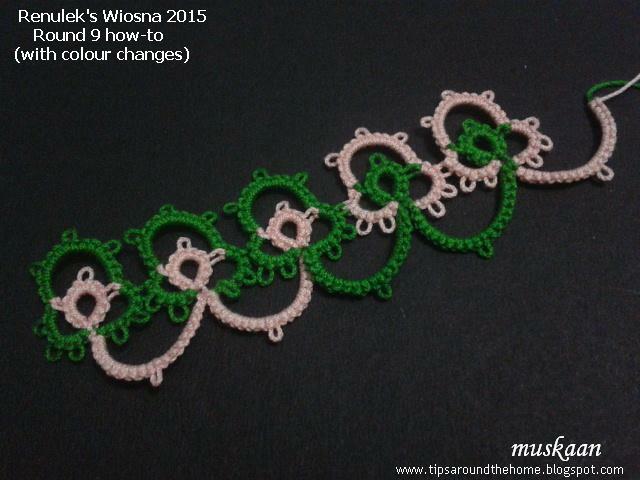 A Craftrean is working on Renulek’s Wiosna 2015 and referring to my notes. This prompted me to read through my Round 9 notes. Errrghh ! Unnecessary complication! In light of more experience, here’s a simpler, more direct method of working that round, with shuttles always in position (no SLT or ungainly cross-threads). And how changing the base join can change colour placement. Start with 2 shuttles, CTM (if using one colour). I have used 2 colours to differentiate the 2 threads at a glance and also to illustrate colour placement options. Refer to Renulek’s notation here, for the stitchcount. When working from the backside, you can use the reverse order of half stitches (RODS - optional, but indicated). Lock/shuttle join to ring picot. Continue around the ring as per pattern. Last chain is to be attached in space between ring and chain as indicated by the pin in #5. Lock join to base. (see join options below). Switch shuttle and work ring backside. Notice that it is worked like a thrown/thrown off ring. After closing ring, Reverse Work. Work chain frontside and join to previous motif as per pattern. Continue around. 2nd motif complete. Continue in similar fashion for entire round. When working with a single colour, the above method is sufficient. But when we work with 2 colours, choices need to be made between colour of ring, colour of chains around ring, and colour of chain between adjacent rings. We already know that colours can be switched using the SLT or shoelace/overhand tie. I am not a great fan of this method, but it does the job. Instead of a Lock Join at base of ring, an onion ring join can be used. Pull a loop of chain thread & pass core thread through it. Tension and continue as before. Compare the change in colour placement with first two motifs. If we use onion ring join, the switch in colour will happen naturally after every 2 repeats. Pull a loop of core thread as if making a lock join. But encapsulate the chain thread within, and then make the lock join. This tends to switch shuttles/colours automatically. What we would do with LJ+SLT, is accomplished with one RJ. Compare colour placement with earlier motifs. In conclusion, for the same pathway and working, we can choose our colour placement by choosing the type of join. And, of course, there are many options available to work Round 9, as discussed in the earlier post and here. If anybody wants larger pictures or a pdf, please let me know through comment or email and I will mail the original pics to you or upload the pdf. misses can be good ! my design path from learning to needle tat to pendant to shuttle tatted snowflake ! There are multiple inspirations and paths to designing; some are project-specific, others can be internalized. Long-time readers may remember many of the design paths/ processes shared, with more to come. I will keep adding them under Design Ideas and Processes . Feynman was brutally honest in sharing his mistakes, failures, and dead-ends along with successes so that others knew the exact pathways - the hows and whys. In designing we learn from our mistakes and can put the misses to good use. 2 recent adaptations arose from doubling the chain length (The Heart Within) and joining rings incorrectly (Reflected Nights snowflake). But much earlier, I’d outlined how my needle-thread size mismatch led to a medallion (snowflake) instead of a pendant, and why the name 'neemiss' was coined. Here, I’d like to share more pics and details of the process for any budding & interested designer. Never be scared to experiment or to redeem & repurpose mistakes ! It started with me trying to learn needle tatting using a thick mattress needle with size 20 thread ! DAY 2 : Burlesque Pendant ! Next day I tried clovers and chains. Then a Josephine rings at end, including a thrown JR. It was all so quick and easy, that instead of going around, I decided to return from the other side to create a pendant. Added tiny silver bells and a few rings in the empty space. There are a lot of mistakes, but it was a very liberating experience – back then I struggled to design in 2D. Called it the Burlesque pendant because of the red-black combo. 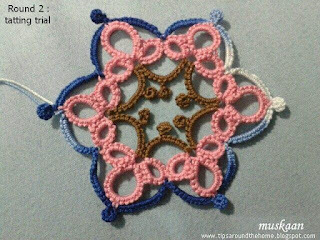 In order to convert the pattern to shuttle tatting, I wanted to change only one design element – make the center ring of second clover larger to get a well-defined dip/point. Instead of 3-6-6-3, I made it 3-8-8-3. Horrors ! 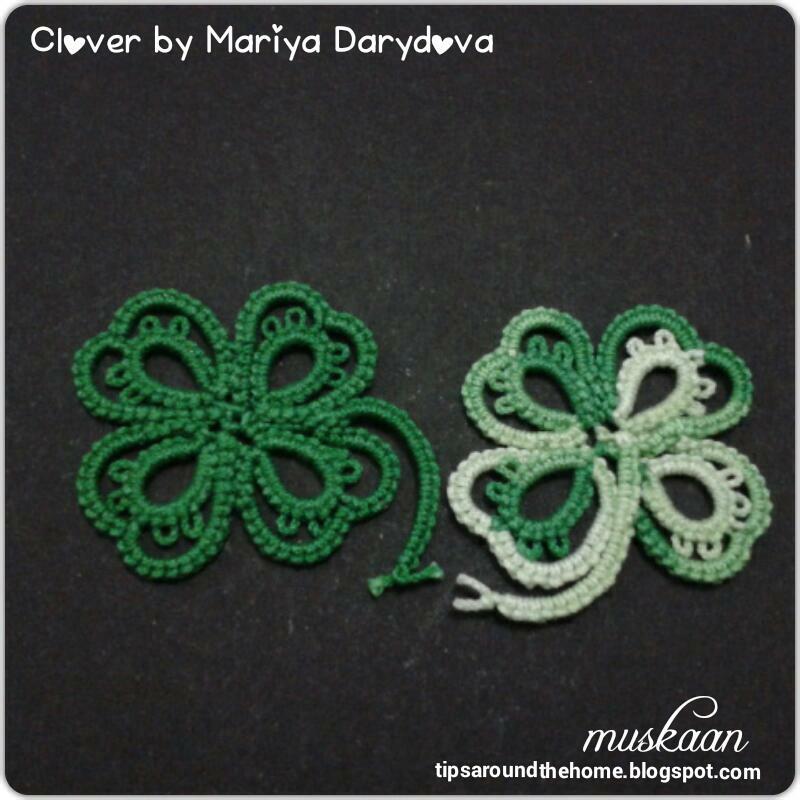 As I finished tatting 3 clovers, the pendant shape was a compact half circle instead of a broad arc! 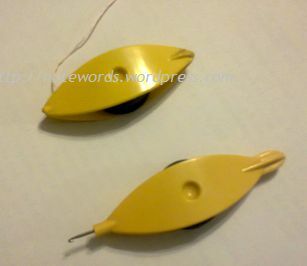 Needle to shuttle conversion was awry because needle was too large for size 20 thread in pendant. Nothing to it but to go ahead and complete the circle. Went with this one, but as you can see below, not fully. So now you know the reason why alternate clovers have a different stitchcount ! The final pattern can be found here. That’s it. 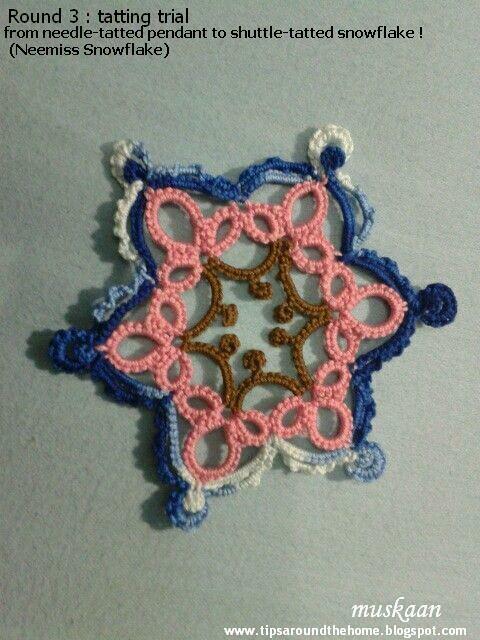 Two days of needle tatting gave rise to a snowflake. I now have 2 sets of tatting needles, but no time to take it up seriously ;-P Yet, I maintain, that testing & trials can make for quick work if needle-tatted, then convert the final to shuttle. Let’s see what this year holds.